Win or lose, in picking a running mate Senator McCain will also be conferring front-runner status on a candidate for his party’s future nomination. A selection that reassures wary conservatives will help to enthuse his supporters for the tough race he faces. We also assume the Senator appreciates that the right pick is good politics. Should the senator make an error in judgment in these respects, however, conservatives should have an insurance policy. With the names of unacceptable candidates being bandied about as possible picks, conservatives should bear in mind that they are not powerless with respect to McCain’s choice. The delegates to the Republican convention have real clout. Even McCain’s own delegates should be willing to use their power, if necessary, to pursue the party’s (and McCain’s) best interests. Those rules are such that delegates cannot vote against the presidential candidate’s vice-presidential pick. But that pick needs a majority of all delegates to win the nomination, and delegates are allowed to abstain. If a majority of six states’ delegations support another vice-presidential candidate, meanwhile, they can force a floor vote on that alternative. Six delegations are all that is required to contest a portion of the platform, too. Most conservatives are willing to support McCain this fall, with varying degrees of enthusiasm, and are willing to work with him before and afterward. But conservatives are not, and should not be, willing to go along with McCain no matter what. Delegates should be prepared to stand for their principles, and the party’s future. Picking the right Vice President candidate won’t win you an election, but it can help you lose it. McCain is in such a situation. If he picks the populist Mike Huckabee he upsets economic conservatives. If he picks a pro-abortion candidate he alienates social conservatives. Mitt Romney would be a safe pick. He was talk radio’s and many conservative activists’ last-minute non-McCain pick. The flip-flop attacks wouldn’t hold as much water, but I’m sure either Team Obama or Team Clinton could confront Romney with some ads he ran against McCain. But then again, voters don’t choose a President because of the running mate. 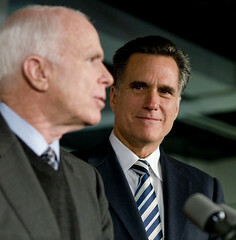 On the plus side, Romney could be McCain’s chief economic expert. McCain will need all the help he can get during these troubled economic times. Because of the bad blood from the primaries I can’t see McCain picking Mitt. McCain is all about straight talk. It’s common knowledge he doesn’t like Romney, and picking Romney would cut against his brand. Republican base politics will play a role in McCain’s pick, but I don’t think it will be the most important consideration. In Intrade traders has Romney trading at 12.5 with Minnesota Governor Tim Pawlenty trading higher at 23.1. The Intrade leader is the field at 48.1 meaning traders think someone like South Carolina Governor Mark Sanford is a more likely pick. If Jeb Bush had a different last name he’d be the no-brainer pick (and could have been the Presidential nominee), but that’s the hand McCain and conservatives have been dealt. This entry was posted on Wednesday, March 12th, 2008 at 4:37 pm	and is filed under John McCain. You can trackback from your own site. Mitt Romney would be a safe pick. Indeed; Romney would be able to advocate any and all sides of a policy question if he thought it will help. I would have to agree that I think Mitt would be a great choice, especially from the Economic standpoint. I looked into Minnesota Governor Tim Pawlenty a bit, and honestly he does not excite me. Hooligan, Pawlenty’s upside is he puts Minnesota and maybe Wisconsin into play. Although I think McCain himself makes those two states more competitive.